﻿ CAN BREAD BE HEALTHY? One of the first things individuals miss when they move to a nutrient-dense diet is bread! It makes sense…bread, even whole wheat, typically contains sugar and refined flour, and becomes the vehicle for mayo, meats, and cheese. It’s the trifecta of pleasure and standard in the American diet. Bread, meat, cheese, and sauce, but no healing nutrients. I would never claim bread to have healing nutrients on par with dark, leafy greens or bright, antioxidant-rich fruits. But, what if you could enjoy your bread and make it healthier too? Check this out…Imagine eating a piece of bread or a tortilla that is also a complete source of protein, on par with meat and milk to provide all nine essential amino acids. That’s pretty much a dream come true in my book, especially when I’m not adding the simple sugars and refined grains of white or wheat bread! Think sprouted grains, my friends! Grains have long been in the spotlight for questionable addition into our diets, and for good reason. Just like nuts, beans, and seeds, grains contain phytic acid, an enzyme inhibitor, which protects the plant for ideal growing conditions in which germination can occur. Unfortunately, the issue with phytic acid is that it’s also what binds to minerals, yielding other nutrients impossible to digest it, therefore contributing to nutrient deficiencies and digestive issues. (Now you know why so many people have grain and nut issues! )Nuts, seeds, grains, and legumes are all great protein and nutrient sources, but proper and healthful consumption requires they be soaked! Happily that’s the case with sprouted grain breads. Grains ‘sprout’ when soaked in water and their green sprout grows, allowing a group of enzymes and chemicals to nourish the wheat’s germ and endosperm (two out of three sections of what is considered to make up a whole grain).” This process, called germination, increases the nutrient value of the grains and makes vitamins and minerals—like vitamin C and B, which you don’t get from regular whole wheat bread—more readily available. Sprouting also breaks down the anti-nutrients, such as phytic acid, that inhibit the absorption of nutrients and minerals. This makes it easier for your body to absorb calcium, magnesium, iron, copper and zinc. The soaking process also supports gluten’s being more digestible by breaking it down before you consume the bread! I’m not saying someone with an autoimmune disease such as celiac or with gut permeability issues should consume sprouted grain bread, but sprouted grain bread is certainly a more nutrient-dense option than the standard white and wheat bread! In particular, sprouted grain bread provides a huge boost of fiber and is bread with a low glycemic index to keep you full longer and to keep your GI tract healthy. That’s a win-win in my book. 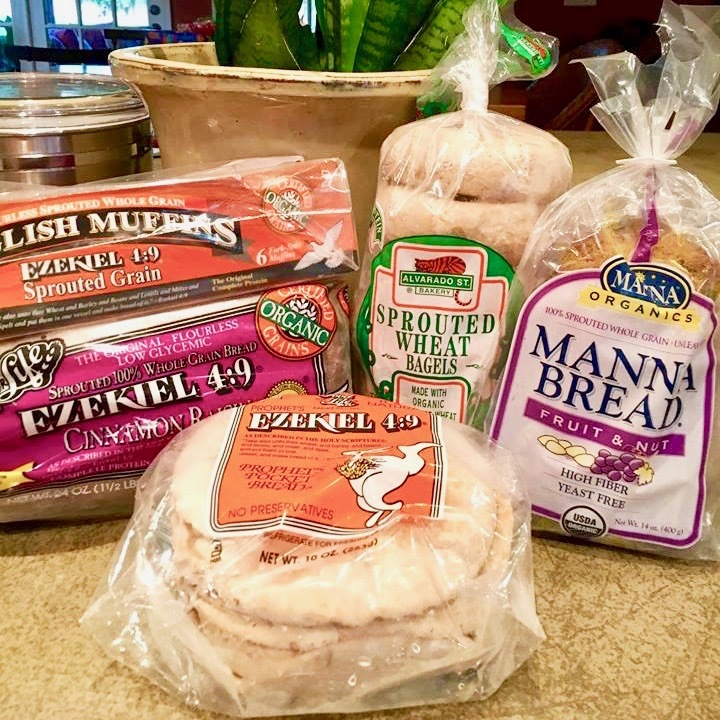 Sprouted Grains are available in your frozen food section as English muffins, sandwich bread and toast, raisin bread, bagels, breakfast bread, burger buns, and even tortillas! Please note, you must keep them frozen since this bread is food that is not preserved but is ALIVE! 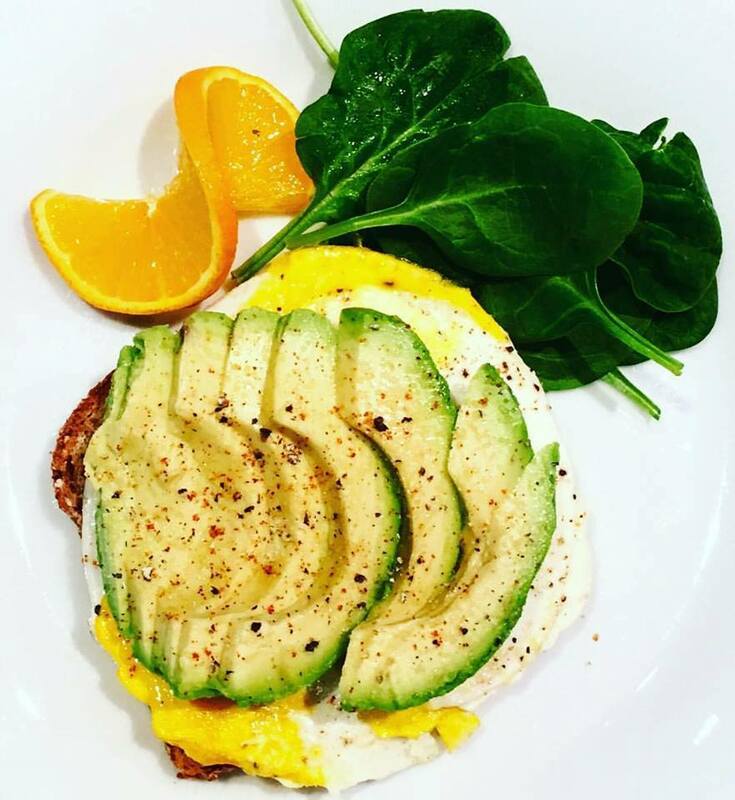 Grab a loaf of sprouted grain bread on your next trip to the grocer or health food store and check out my go to breakfast following a fun, morning run: Sprouted Grain Bread, egg, spinach, orange, half avocado, pink salt/garlic powder/cayenne/black pepper. Totally nutrient dense and lots of protein for muscle recovery, metabolic boost, satiety, and to start the day off right! YUMMY!